Winner of Norway's Leading Resort in 2018 at the World Travel Awards! 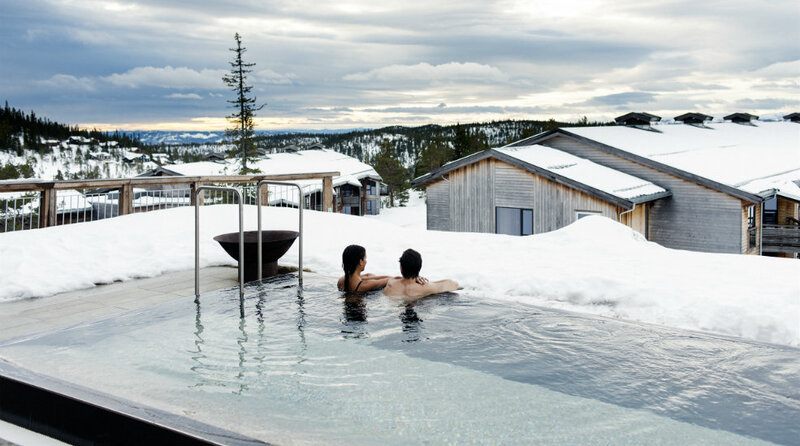 Norefjell Ski & Spa has also been chosen as Norway's leading spa resort for many years, most recently in 2017. Ski-in/Ski-out available. Just 90 minutes from Oslo. Norefjell is a Norwegian paradise for winter activities in the mountains, and is just 1 1/2 hours from Oslo. There are lots of activities for all ages here, both on skis or on foot. The best thing about visiting Norefjell in the winter is that you can choose exactly what you want to do. Maybe you'll end up skiing down the slalom runs or going on a cross-country tour. Exploring the mountains surrounding our hotel on foot is also a fabulous experience, in both winter and summer. You can also choose to spend time inside or outside in our hot Jacuzzi. You can put your skis on right outside our front door, and head out onto the slopes and trails. Norefjell Ski Resort has a total of 14 lifts and 26 runs with varying degrees of difficulty. Our terrain park has jumps and rails to suit both beginners and experts. At our ski hire you can rent skis, snowboards and snow shoes and buy your lift pass. At Norefjell there's an extensive network of cross-country ski trails where each trail is colour coded with its own colour on the map. There's a total of over 200 kilometres of trails here. One of our favourite routes is the route to Høgevarde, on which you never leave the mountains and the fabulous views. At Høgevarde the Norwegian Tourist Association runs a tourist cabin that is open on most public holidays and bank holidays in the Norwegian calendar. Please don't hesitate to ask us if you want advice about your mountain tour! Our hotel has its own ice skating rink and toboggan run. You can hire skates, skis, snow shoes and toboggans from us. The children's slopes and ice skating rink are located directly outside our hotel entrance, so parents can keep an eye on their children from our veranda or pizzeria if they don't fancy taking to the ice themselves.